Chinese and European senior officials urged further cooperation through the Sino-Euro railway on Wednesday. 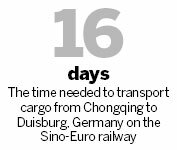 The 11,179-km Chongqing-Xinjiang-Europe railway connects Chongqing with Duisburg, Germany, via Kazakhstan, Russia, Belarus and Poland. "I hope the Sino-Euro railway can extend to all 16 Central and Eastern European countries," said Huang Qifan, mayor of Southwest China's Chongqing municipality, at the Local Leaders' Meeting of China-Central and Eastern European Countries in Chongqing on Wednesday. He said the customs departments of these countries should strengthen cooperation to shorten the time needed to process goods and thus save costs for transporting freight via the route. Customs should work together and share information so freight owners can make only one declaration, have one inspection and one release, and avoid opening carriages at each customs stop, which is time-consuming, Huang suggested. The current Chongqing-Xinjiang-Europe railway has helped some businesses shorten transportation times and save costs since it began operation in 2011, Huang said. 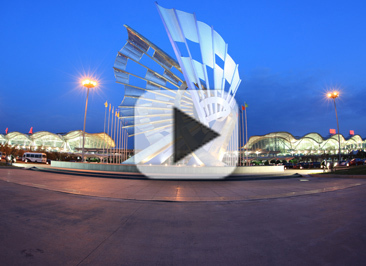 The rail link transports the city's goods from IT, auto, medical electronics and other sectors to European markets. The total value of import and export freight has reached $3 billion, he said. The complete trip takes 16 days, less by up to 20 days than the usual shipping time. The cost is one-fifth that of transporting cargo by air, Huang said. Victor Ponta, prime minister of Romania, also spoke highly of the Sino-Euro railway, saying the line will contribute to the quality of people's lives along the way. However, challenges still exist. Most freight from coastal cities to the Central and Eastern European countries is still transported by ship to Rotterdam, and then transferred by air or road to Russia and Central and Eastern European countries, Huang said. To achieve steady train transportation requires sufficient supplies for both imports and exports, but the Chongqing-Europe railway lacks exports from European countries, participants of the meeting said. Germany, the final stop of the railway in Europe, has high demands for exporting to China by train. "Germany's exports to China consist mainly of cars, machines and other heavy technological goods for which transport costs - which are cheaper on the sea route - generally are a more important factor than transport times," said Gerold Amelung, the German consul-general in Chengdu. He said the majority of opportunities offered by the new transport route are used by Chinese exporters. "However, almost half of all Chinese imports from Europe originate in Germany. For the long-term success of this project - and to fully mobilize its economic potential - it is crucial that the capacity of this route is used fully in both directions," he added. Boleslaw Kosciukiewicz, the minister counselor of the embassy of the Republic of Poland in Beijing, said Poland is very interested in increasing trade with China via the railway. "Our imports from China are 10 times larger than our exports to China," he said. Kosciukiewicz said that increasing exports to China is his country's main interest, as it exports leather goods, jewelry and food products, including pork and chicken.